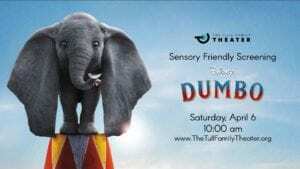 WHAT: The magic, wonder and curiosity of a computer graphic elephant flying in and out of a live-action production will be presented in a sensory friendly screening at the nonprofit Tull Family Theater. Sensory friendly screenings have been developed to serve the needs of all impacted by autism and special needs and those who may have sensory sensitivities. According to statewide research, the need for services to people of all ages with autism is growing, especially for those beyond school years. Inclusive screenings are now regularly available at The Tull Family Theater thanks to the support of the A.J. and Sigismunda Palumbo Charitable Trust, the Thomas Marshall Foundation, the Sewickley Valley Community Fund and Lincoln Learning Solutions. WHEN: Saturday, April 6, at 10 a.m. The Tull Family Theater, a 501(c) (3) Pennsylvania nonprofit, is a film-based arts organization created to strengthen cultural, educational and entertainment experiences in the region northwest of Pittsburgh. Supported by diverse private, public, corporate and foundation revenue streams, the Theater counts among its donors Allegheny Regional Asset District, Huntington Bank, Esmark and the Bouchard Family, more than 700 individuals and its patrons. Their support sustains and expands programming at this independent cinema in Sewickley offering two screens and an event/performance space. © 2019 The Tull Family Theater All rights reserved. The Tull Family Theater is an initiative of Village Theater Company, a PA 501 (c) (3) nonprofit.